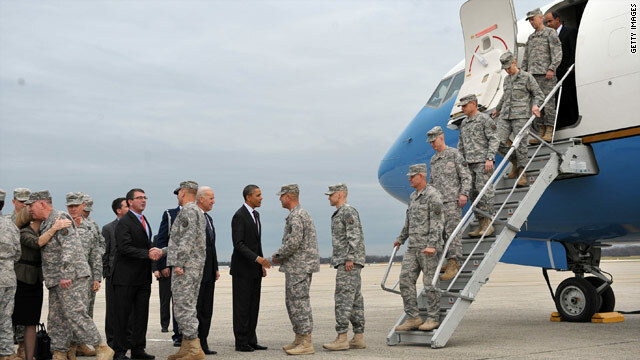 President Obama and Vice President Joe Biden traveled to Andrews Air Force Base Tuesday to greet troops returning from Iraq and the United States Forces-Iraq colors, the military flag that had flown in Baghdad until last week. Neither the president nor vice president spoke at the 45-minute event that featured military families and remarks from Deputy Secretary of Defense Ashton Carter, Chairman of the Joint Chiefs of Staff Martin Dempsey, and General Lloyd Austin, the commanding General of United States forces in Iraq. oh really? After biden says the Taliban are not our enemies....and barac obama supports him too... this is a disgrace. My dead father and uncles, veterans of normandy and the south pacific ww2 campaigns are turning in their graves! This makes me sick! Would you have thought it a better result if President Obama's leaves them there to be arrested for War Crimes committed against a sovereign country, and in violation of a SOFA that was signed by the prior administration ... You Know; DUBYA???? You sir are clueless and I'm grateful that most americans, that graduated junior high, see this as good thing. Do you not understand the many many happy families welcoming home our soldiers? Ohhhh, I get so happy when I see our troops coming home.....to be home for Christman is just a plus. Not to take this happy feeling from anyone who feel as I do....But When are the GOP going to even say a word about or to our troops. I've been watching and waiting for some type of statement to our Brave Ones. Still waiting. I really hate to disappoint such a sweet, loving american as you, but the GOP will not do anything that could possible resemble congratulating our "Brave Ones" for returning home for Christmas. The fact is they (GOP / Teabaggers) would rather be un-American, Hateful, un-Patriotic and continue in their quest to destroy the country just to make Obama look bad.